What really inspires positive change is hope, not fear, according to a leading writer on change and innovation. Alan Deutschman is the author of “Change or Die: The Three Keys to Change at Work and in Life,” first published in 2007. He uses compelling case studies to show how heart patients, criminals, drug addicts and multibillion-dollar corporations can improve their future prospects by embracing change that at first may seem impossible. “My research shows that what really stimulates and sustains a change effort is getting positive results, really being able to feel tangible benefits from the change fairly early on,” said Deutschman, former executive director of Unboundary, a strategy consulting firm for top executives. Deutschman also spent 19 years as a business journalist in Silicon Valley. He has profiled innovators around the world and discovered some of what makes up effective leadership, especially during times of change. His book outlines the “three F’s” -- facts, fear and force -- which he said are often employed but ultimately doomed to failure as change agents. Instead, he said, they should be replaced with the “three R’s”: relate, repeat and reframe. In an interview with Faith & Leadership, Deutschman describes the three R’s and offers examples of how they have been successful in helping individuals and organizations make lasting change. The following is an edited transcript. Q: What’s the problem with the three F’s? We start out by assuming that people are rational, and we’ll give them the facts -- and that doesn’t work. So then we say, well, maybe people are primarily emotional, and so let’s appeal to their emotions. The most powerful emotion is fear, so the second F is fear. We’re just going to try to really, really frighten people in hopes that that’s going to motivate them to change. Then the third F is force. By force I mean falling back on the moral authority of your position. This is what we fall back on when we’ve failed to persuade people either through cool reason or through intense emotion. 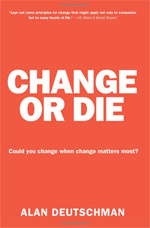 Q: Where does the title of the book come from, “Change or Die”? Q: You explain in the book that people avoid things that frighten them, so they avoid the change they need to make, right? It’s actually a very adaptive response to try to avoid dealing with the problems, because if you don’t, you’re not going to get up and get the kids off to school and feed the dog and get your to-do list done. We tend to actually focus on the things we have to do that we can do and we can get done, as opposed to the long-term problems that seem overwhelming and impossible to us. Q: Why is hope important when people or organizations are trying to change? People have to think that change is possible for them. That’s behind the effectiveness of 12-step programs like Alcoholics Anonymous. You can see people who are like you, who have had the same seemingly overwhelming problems, and that some of them are really changing and making progress. Often [change] starts by connecting with even one other person or a community that you feel some emotional connection with. Q: What are the three R’s, and why are they effective in creating change? The first R is what I call “relate,” and this means forming a close emotional relationship with a person or with a group of peers that inspires a sense of hope and belief that things can be different. If you wanted to learn to play a new sport or to play a musical instrument or to speak a foreign language, you would want a teacher, a mentor, a coach to help you through it. If you have a coach or a mentor who believes in you, that can open that window as well. Once you connect with this individual or community, you start taking actions that get you where you want to go. Q: Talk about the second R -- repeat. In the book, I look at the Delancey Street program [in San Francisco] that takes felons out of the state prison system. They don’t know how to walk the way middle-class people walk. They don’t know how to talk that way. Delancey Street tries to teach them how to live in law-abiding, middle-class, sober, nonviolent society. Change in our lives is the same way. There are just dozens and dozens of small things that we need to actually learn by doing and doing it again and again. I grew up in the Jewish tradition, where in the Old Testament and the Torah, it’s actually about the practices. In the Torah, there are 613 direct commandments from God, often little things that you’re supposed to do from day to day. These little actions and daily practices instill the belief, as opposed to the belief informing and motivating the action. Of course, it can work both ways, but I’ve found that many successful programs are focused on the actions of daily living. In Alcoholics Anonymous and some 12-step programs, they say, “Fake it until you make it.” You go through certain actions and steps until you ultimately come to a new understanding. Q: The third R is reframe. It sounds like telling a new narrative of yourself. As in many spiritual traditions, it’s a vehicle for atonement and for reckoning with the way you used to be. It’s a profound thing. Q: At IBM, how were the three R’s cultivated and used to create a new structure that made it a learning organization? The more successful you’ve been, in many ways, the harder it is to change. Your culture and your people have deeply entrenched beliefs about who they are and the way things are supposed to be. Here was a company that in many ways was the most successful company in American capitalism. When there was a profound shift in technology, IBM found itself going from having been the most successful company in American capitalism to being threatened with going out of business. IBM experienced its own change-or-die crisis as an organization. After IBM nearly collapsed in the early 1990s, they brought in a new chief executive officer, Lou Gerstner, who had been the head of Nabisco. The IBM people derided him as “the cookie guy.” Then the cookie guy hired as his chief of strategy [J. Bruce Harreld], a man who had helped found the Boston Chicken chain of fast-food rotisserie chicken restaurants. This created a mentor relationship between the chicken guy, who knew about entrepreneurship, and the veteran IBM executive. [Their relationship] went through stages of change as they went out and started a new business. [Adkins] learned new skills and habits by actually going out and building experience. Ultimately, that executive created a new multibillion-dollar-a-year business and made the shift from thinking like a bureaucrat to thinking like an entrepreneur. Once IBM had this one example, other senior executives saw that it would be possible to succeed, and that led to a bigger shift in the entire corporate culture. Q: If a leader in a long-established institution sees the need for change, how would you recommend that he or she proceed? Change could be inspired by making new connections with other spiritual communities or other spiritual leaders who have different approaches. Have a contingent from their group come spend time together with you. Making that connection with other people who are similar enough to you that there is mutual understanding and respect, but different enough that you can see the possibility and the value of doing things differently, could lead to the possibility of change. Q: The three R’s rely on people beginning in their comfort zone, then moving out of it. What’s the balance there? If I’m trying to become a good tennis player and I’m watching [tennis champion] Roger Federer playing in Wimbledon on TV, I know I’m never going to be Federer. He’s like a different species. But if I go to my neighborhood tennis courts and see someone who, like myself, is 46 and a little bit out of shape but who is really doing a good job playing tennis, I might think, “If he can do it, maybe I can do it.” Having a connection with people we can see ourselves in, to some extent, helps make it seem more real and more attainable. Q: At the end of the book, you apologize for the dramatic title, “Change or Die.” You say that it ought to be “Change and Thrive.” Could you talk a little bit about the notion of thriving and the conditions of change that make thriving possible? As Americans, whatever our background, there is still this almost Puritan-like influence, the Protestant work ethic, a sense that things have to be painful for us to progress and thrive. But what I’ve found in my research is that in change efforts that work, people really feel the benefits. That is extremely motivating. Look at the Dean Ornish program for heart patients. People go on this very rigorous diet early on with the idea that they want to quickly get to the point of losing weight. People are feeling better because of these new benefits, and that’s extremely motivating. Q: Your book came out first in 2007. Has anything changed in the landscape of change issues? The economic and financial collapse that has occurred since my book came out is starting to lead people to live in different ways. For many of us, our expectation of never-ending prosperity and limitless economic opportunity has ended. We’re starting to reframe a new concept of how we should live our lives and the role of our economic lives in our well-being. People are starting to think that maybe it’s OK to rent rather than to own my home, and maybe there are other things that are more important in life than buying another big house or big car. I wonder if whether, as a culture, we’ve become open to the possibility of good, fulfilling lives without repeating the same economic cycles of the past three decades. Q: Is that a reframing of our national story? Exactly. We had this national story that we told ourselves, as a people of the American dream, of great, limitless prosperity. It will be interesting to see whether, after two or three or four years of living in a different way, we may be starting to think about our lives in a different way. It will be interesting to see how we change and adapt -- or whether we don’t.